The functions of "CatPaw Calc Simple"
Four arithmetic and power operations(Simple mode). Expressions and the calculation result are recorded as History. Value of textview C(the figure below) can be recorded ,added to the memory. To calculate expressions, you input numbers and operators(+,-,*,/,^) or functions using keyboard(D in the above figure). * is multiplication , / is division and ^ is power operation(for example 2^3 is 3rd power of 2 and the result is 8). You can use a decimal point for the exponent numbers(numbers after ^). In "Simple mode",√(square root) key is not available. However you can calculate square root using ^ key. For example when you find the square root of 2 ,enter 2 ,^ ,( ,1 ,/ ,2 and put ) key at the end ,that is 2^(1/2) equals the square root of 2. 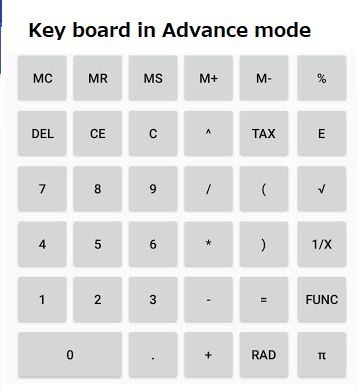 In "Advance mode",√ Key is available for square root calculation. To delete input numbers ,formula and calculation result ,the key C ,CE and DEL are used. Tapping C key clears the contents of all textviews A,B and C. When you tap CE key ,the textview B is cleared. The DEL key undoes the last operation. Tax key is used for calculation of value-added tax or consumption tax. When you tap the tax key ,the value in textview B is multiplied by setting tax rate and the result is shown in tax calculation textview C.
Tax rate and rounding method are set by [Set tax calculation]dialog opened by choosing[Set tax calculation] item from the action menu(E in the above figure). If you do a long press of numbers on tax calculation textview C ,the context menu is opened. By selecting an item from this menu ,you can add tax calculation value to the memory and retrieve current memory value and do other memory operations. Tapping "the menu display button"(E in "Name of each part") opens the menu. The function of each item is as follows. [Set tax calculation]dialog is opened. By using the dialog ,you can set tax rate and rounding method for tax calculation. 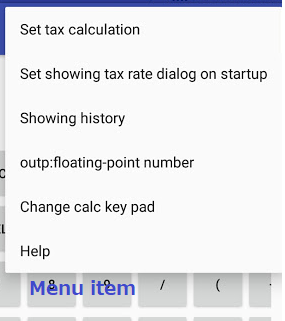 [Set tax calculation]dialog is automatically called after first starting the app ,but at startup of second time or after the dialog is not shown. However this item is tapped ,at the next startup the dialog is opened. History(list of expressions and the answers) page is displayed. You can choose floating-point number(e.g. 1.5) or irreducible fraction number(e.g. 3/2) as the output format for caluculation result. Tapping the item changes output format. Open the dialog that you choose "Simple" mode or "Advance" mode. In Advance mode ,you can evaluate square root ,reciprocal number and calculate several scientific functions. The memory function is available for input numbers or calculate value. Start a browser app and open this page. The result of tax calculation is rounded to the nearest integer.You can select the rounding method by using [Set tax calculation]dialog. 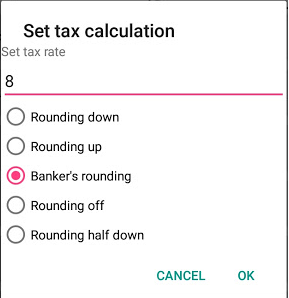 [Set tax calculation]dialog appears by tapping "Set tax calculation" on the menu. Tax rate(initial tax rate is 8 percent) and rounding method can be set using the dialog. The rounding methods are as follows. Values are rounded towards zero. Positive values are rounded towards positive infinity and negative values towards negative infinity. Values are rounded towards the nearest neighbor. Ties are broken by rounding to the even neighbor. Values are rounded towards the nearest neighbor. Ties are broken by rounding up. Values are rounded towards the nearest neighbor. Ties are broken by rounding down. 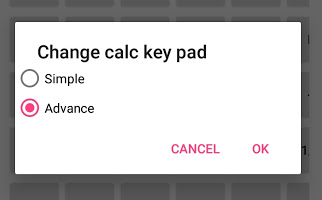 Tapping "Change calc key pad" on the menu opens "Change calc key pad" dialog. Choosing "Advance" in the dialog ,the key board changes to one for Advance mode. In "Advance" mode ,you can use several scientific functions and the key for root calculation. The key for evaluating reciprocal is also available. Using Memory keys ,calculation value or input numbers is added to ,subtracted from the value in the memory. E...This sign means ten to n-th power. For example 1.2E2 means 1.2×102 = 120 ,1.2E-2 means 1.2×10-2=0.012. 1/X...Calculation of reciprocal number.Tap the key after entering numbers you want to find the reciprocal value. FUNC...Tap the key and open "Function choose" dialog. 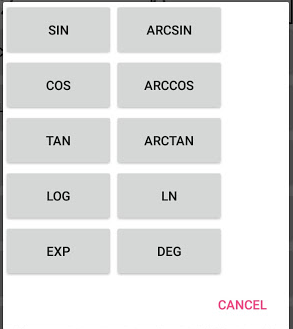 Using the dialog ,you input mathematical function. π...The key for inputting of Pi (Circular constant). RAD/DEG...To switch arguments of trigonometric and these inverse functions from radian to degree when the sign of the key is RAD and switch from degree to radian when the key sign is DEG. Here is the explanation of memory keys added to Advance mode. The function of each key is as follows. The value in textview for "showing input numbers and calculating result" is recorded in the memory. The value recorded in the memory is displayed in textview for "showing input numbers and calculating result". The value in the memory is cleared and zero is set. The value in textview for "showing input numbers and calculating result" is added to the memory value. The value in textview for "showing input numbers and calculating result" is subtracted from the memory value. Tapping [FUNC] key in Advance key board opens the dialog displaying list of functions used in the calculator. Push function name you want to use ,then the function is input in "Textview for displaying formula". Nine functions are available.The detail is as follows. RAD/DEG...The argumens of trigonometric and these inverse functions are given in radian or degree unit.When radian is set ,the button symbol is DEG and tapping the key switches argument unit to degree.